Oligofructose is a form of dietary fiber found in vegetables and other plants, but it's available as a supplement also. A prebiotic, it serves as food for "friendly" bacteria that live in your intestines. In addition, it's a soluble fiber, which means it dissolves in water. If you eat plenty of fruits and vegetables, you won't have trouble getting enough of this fiber from your diet. As a dietary supplement, oligofructose may offer potential benefits. It appears to boost feelings of fullness, reduce hunger and lower calorie intake. Oligofructose belongs to a subgroup of inulin -- a class of soluble fibers. 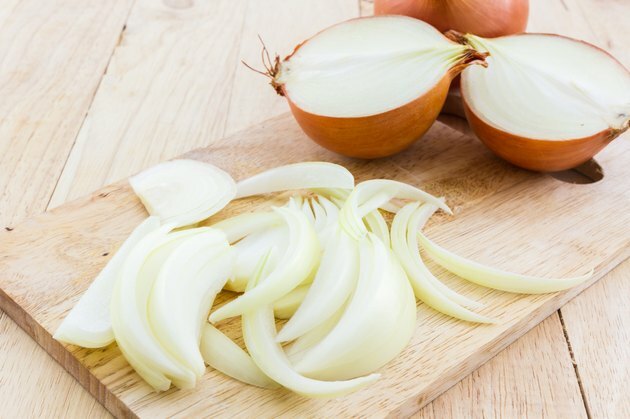 It's found in various vegetables and plants, including onions, bananas, garlic, chicory and wheat, according to a review published in the July 1999 issue of the "Journal of Nutrition." Oligofructose is commonly used to fortify food with fiber and possesses a clean, sweet flavor. Fortified foods such as cereals, fruit yogurt, frozen desserts, cookies and nutritional dairy products may contain oligofructose. Oligofructose is a form of carbohydrate that does not raise blood sugar, according to the "Journal of Nutrition" review. This makes it ideal for those with diabetes. In addition, because it passes through your system without being metabolized, oligofructose is lower in calories compared to typical carbohydrates. Nearly all the oligofructose passes into the colon where it is fermented by bacteria. The fermentation process contributes 1.5 calories per gram. Typical carbohydrates provide 4 calories per gram. A small pilot study found that oligofructose promotes fullness and helps decrease food intake. In this two-week trial, volunteers took 8 grams of oligofructose twice daily. Oligofructose increased satiety at breakfast and dinner and significantly reduced food intake at breakfast and lunch. The authors propose oligofructose supplements may help those who are overweight or obese reduce their food intake. The results were published in the May 2006 issue of the "European Journal of Clinical Nutrition." In addition to its other benefits, oligofructose is good for digestive health. It is a prebiotic, which means it stimulates the growth of beneficial bacteria in your intestines. It promotes the growth of a colony called bifidobacteria. These microorganisms prevent the growth of harmful bacteria, help absorb certain nutrients and help produce B vitamins, according to the "Journal of Nutrition" review. Oligofructose is found as a dietary supplement in prebiotic formulations. Because it is a fermentable carbohydrate, supplementation may cause mild gas and bloating, at least initially. Journal of Nutrition: Inulin and Oligofructose: What Are They?